Open Adoption | CHRYSALIS HOUSE, INC.
To celebrate National Adoption Awareness Month, we are sharing another story written by a loving Mom (& proofread by Dad!). They began their domestic adoption journey to become first-time parents over 12 years ago. Along the way, they’ve handled unexpected challenges with grace and stayed the path they felt meant to be on. Together, they have built an adorable little family …one adoption at a time, and are now raising three gorgeous kiddos! Again, we have Facebook to thank for an ongoing connection ~ and the privilege of watching their family enjoy a lovely life together. Many thanks to her for sharing the blessings of Motherhood, below. I knew. I knew for as far back as I could remember. He pointed all the signs and my heart to adoption. It was just going to be a part of my life and I saw the signs that God was giving me the entire time I was growing up. Little hints along the way. Confirmation came the night I found out my boyfriend (and now my husband) was adopted. It made me smile because at that moment I knew he was the one. If adoption was in our future, he would be the perfect mate to raise adopted children with because his experiences would strengthen our journey. Thank you God, for yet another sign that I was walking the right path all those years ago. I remember early on sitting across from our IVF doctor after several failed and intrusive IVF attempts and flat out asking him, “Is this going to work or should we move on to adoption?” His response, after all these years, is still so vivid in my mind and even stings a little, “Well, that would be like giving up”. If he only knew what “giving up” meant to our family today, I’m pretty sure his response would be different. We “gave up” only to “give in” to a lifetime of happiness, family, and ultimately parenthood with three amazing and adopted children. We have been given the privilege of walking three amazing little people through childhood and life all because of adoption. Our oldest son is 12, our middle son is 9, and our daughter is 6. We were fortunate enough to be present for all three of their births, taking in the sights and sounds of each. Hearing first cries, cutting cords, watching first baths, seeing first smiles, and holding swaddled newborns in our arms. Each birth was so unique and different and today distinguishes who they are. We were given three very special and unique gifts and promised to take care of each of them. And yes, there is life after adoption. Last week, I was at lunch with a girlfriend and we were discussing our children, as most mommies do. We were sharing successes and struggles. We were saying how frustrating the teenage eye roll can be. “Yes”, my friend said to me, “you give birth to them, the least they can do is not roll their eyes at you”. And in that moment we both laughed because she had completely forgotten that, I didn’t physically give birth to my kids. We have given them a good life, a family, and a whole lot of love. Giving birth is not required to raise a family. Adoption is part of who they are, who we are as a family, and a selfless gift given to my husband and me. We are raising them with all the same struggles and success as any other family; baseball, Band-Aids and bruises, dance, tears, soccer, student council, failed tests, school awards, and the all so frustrating sibling squabbles. You see, it’s no different. We tackle each day as a family; a very blessed family full of adopted children. Every once in a while when I hear one of them call me “mom”, I smile, turn, and see a sweet child staring back at me. I realize they are talking to ME, their mom, and know it was all worth it, every single tear, heartache, and disappointment throughout our adoption journey. I love being their mom and will continue to help guide, nurture and love them as they grow up and become adults. I appreciate life so much more because of our struggles to have a family but know we are better off because of our three precious gifts. My HOME is full of children, my MIND is full of memories, and my HEART is full of love. And I’m pretty sure that makes me one very blessed MOM. 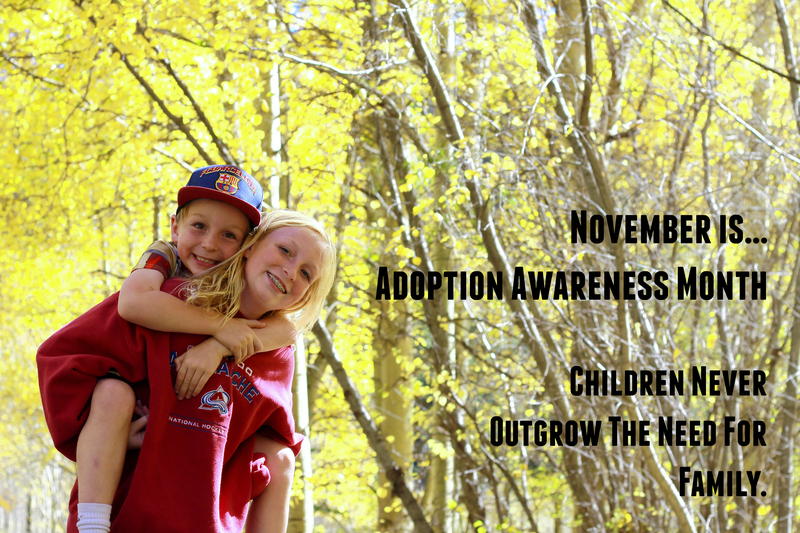 November is National Adoption Awareness Month. In the spirit of bringing awareness to adoption, our agency mission and the successes of families we serve — we hope to fill our blog with guest stories throughout this month. Chrysalis House, Inc. believes in the power of sharing experiences and in learning from the stories of others. We present this series, realizing the words might be the insight that an adoptive family, adoptee or birthparent is searching the internet for! Our sincerest thanks to the families who have put their lives into words. We are still seeking & accepting submissions through the month of November! Please send your submissions to stacy@chrysalishouse.com. Below, please enjoy the story of a family’s: Domestic Adoption. In the event you wish to discuss our Domestic program, please contact the office at 559.229.9862. 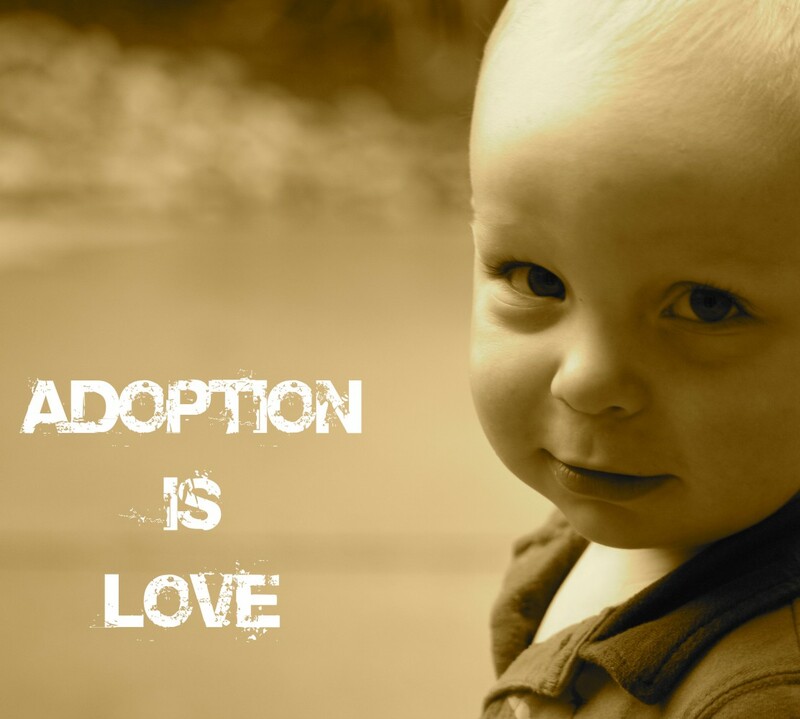 Ever since I was in high school, I have thought about adoption. I knew a few families in our neighborhood who had adopted and saw how it changed their lives. For some reason, it resonated with me and I always felt like it would be a part of my life in some way. For my husband, adoption was even closer to home: his father and uncle were adopted from birth. My husband saw adoption as a huge blessing and was very grateful to his father’s birth mom for making the courageous decision to place him in his family. As we dated and started dreaming about the family we would one day have, we both talked about adoption as potentially being a part of it. I think, however, that we both figured that we would have biological children first while we were young and then adopt one or two as our family was more established. After we were married for a few years, we initially thought about starting our family through the “typical” way of getting pregnant. But we both felt that something different was out there for us. As we pondered and prayed about how we should start our family and when, we both felt a strong impression that we should pursue adoption now – not as a last resort and not once we were older and more established. So the next day we researched local adoption agencies and by the following week, we interviewed several in Fresno. These introductions opened our eyes to multiple ways one can go about adoption – domestic, international, fost-adopt, etc. While we liked all agencies, we felt a more personal bond with the people from Chrysalis House and decided to work with them. We felt that domestic adoption was the right path for us at this time – we really wanted to look locally to help someone out, and we weren’t quite ready for the uncertainty that can come with fost-adopt. Both my husband and I are go-getters and so we barreled through the application process, turning in all the paperwork and meeting the requirements just as fast as we possibly could. Once we had made our decision, we felt so good and clear about it that there was no turning back and we were anxious to be in a position to welcome a little baby into our home. Both my husband and I really appreciated the classes that were given as part of the application process, as we had our own concerns. For my husband, he was fairly concerned about open adoptions. His father’s adoption had been closed and his father never pursued a relationship with his birth mom, so that’s what he was used to. We had heard stories about birth parents trying to get their children back, or trying to co-parent once their child was placed and that wasn’t something we wanted. Through hearing testimonials and learning more about what open adoption means, we both felt reassured. We knew that we could work out guidelines with the birth mother that would make both of us feel safe and comfortable. Additionally, we both realized that having more people out there who love your child, even if distantly, is never a bad thing. For me, I was initially concerned about raising a child different than my own ethnicity. I personally had no problem with it and we were open to adopting all races, but I was worried about our child feeling like s/he could still connect to his roots, while at the same time be a full part of our family. I wanted to teach our child my family’s wonderful history, as well as his, but I didn’t know if I could do it justice. Again, the testimonies and discussion around raising children of different races was extremely helpful. I understood more completely the issues that children could go through and that while there might be difficult times of identity issues, that it was something we could tackle with love and empathy. After we got approved came the hardest part of the process: waiting. In some ways, it was a bit of a let down. While getting approved, we had felt good being busy, proactive and working towards a goal. Once approved, we realized how helpless we were in the rest of the process and that we simply had to wait patiently until an opportunity arose. While we tried to lead our normal lives, our minds definitely were fixated on hoping and praying that we would receive a little baby sooner rather than later. Luckily, our wait was not very long (something for which we are very grateful!). We soon welcomed home a precious baby girl. While we didn’t have a lot of notice to get things ready, we were so excited to start our family. We both immediately fell in love with her and couldn’t imagine our lives without her. While adoption will come with its own particular struggles and ups and downs, we are so grateful for this opportunity. We feel a great deal of admiration and respect for our girl’s birth mom and the choice that she made. We are in love with our little girl and she couldn’t have been a part of our family any other way. We are looking forward to her growing up (not too quickly, though) so that we can share her wonderful story with her. Creating Awareness: of a Birthmother Experience. 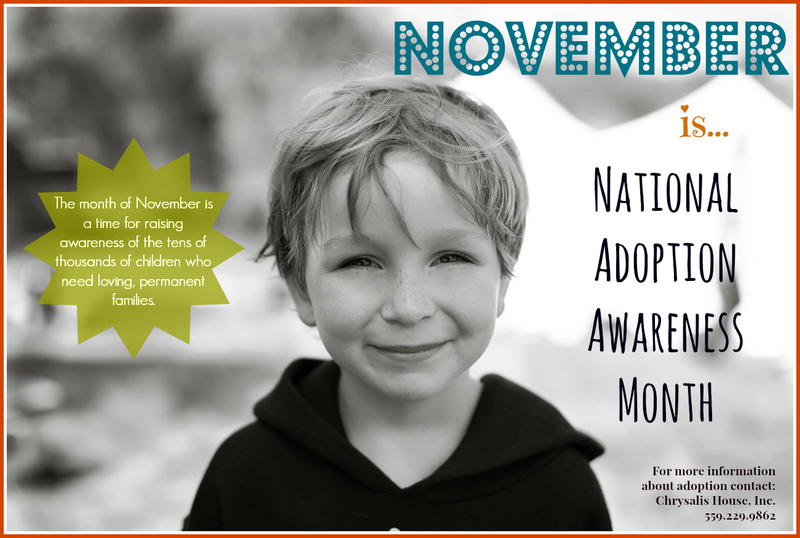 November is National Adoption Awareness Month. In the spirit of bringing awareness to adoption, our agency mission and the successes of families we serve — we are filling our blog with guest stories throughout this month. Chrysalis House, Inc. believes in the power of sharing experiences and in learning from the stories of others. We present this series, realizing the words might be the insight that an adoptive family, adoptee or birthparent is searching the internet for! We are still accepting submissions through the month of November! Please send your submissions to stacy@chrysalishouse.com. Please honor today’s story, from the perspective of a: Mother – who chose to place her child in the arms of another family. The story is important, beautiful and powerful… & the honesty speaks volumes. Of all the posts we’ve shared this month, we envision that this was the most difficult to write. Our sincerest thanks to this Birthmother for putting her experience, love and grief into words. There is such value in your story and we are filled with gratitude that you have allowed us the privilege of sharing it. Birthmother. Such a simple word with an entire world of complexities behind it and one incredibly important piece to the miracle of adoption. People who are foreign or unrelated to adoption may think of a birthmother as a woman who doesn’t want her child or someone who doesn’t want to take responsibility for her actions. People who are familiar with adoption may view a birthmother as I do—a courageous, selfless, loving woman who gave life to a child, then decided to give her child more. I am a birthmother to the most incredible, beautiful, loved little girl who ever existed. I made a voluntary plan of adoption for my daughter, a decision that did not come lightly, at the young age of 17. Upon discovering my pregnancy, I was afraid and alone. Abortion weighed heavily on my mind during the first few weeks of that discovery. Being so frightened of this life changing circumstance I finally told my cousin, my confidant, and through speaking about it, I decided to continue with my pregnancy. Telling the rest of my family was not so easy. While I didn’t expect a congratulatory celebration, I was astounded and deeply hurt by the harsh rejection I faced for the majority of my pregnancy. At this point, my options were to find a new family for my child or to have my child and not return home. I chose the latter. I graduated high school after my first semester of my junior year, started working, applied for college, and just knew I could make this work. I could fulfill my dreams of graduating college and having an established career while simultaneously raising a child without familial support. I would struggle, but I was capable, intelligent, driven, and had enough love for my child to be a good parent. I knew from the moment I decided to follow through with my pregnancy that I would be enough. However, about the time I was six months pregnant I decided I wanted her to have more than just enough. Just as I had a plan for my future with my daughter put into place, adoption was put back onto my heart by my own will this time. For me, it was a sudden moment of realization that this decision wasn’t about me anymore. Soon I would be bringing this little girl into the world and this decision had to be about her, what was best for her, what I wanted her future to look like, and in that moment I became a mother. I realized I didn’t want her to spend her childhood waiting for me to get my life together. I had to put my child first, and as a parent, that’s what you do. You put your child first. I went to multiple adoption agencies in order to have the largest pool of waiting families to pick from as possible. I decided if I found the perfect family then I would make an adoption plan, but I had very high expectations of that family. I was still very confused and didn’t think it was possible for anyone to love her as much as I did. But I still looked through dozens of albums and met with some waiting families. I was let down a few times, hopeful a few times, but ultimately I was running out of time. I met with one couple less than six weeks before my due date, and I remember leaving that meeting sort of at peace. The next two days following, however, were the most exhausting and confusing that I can recall. I was playing out three scenarios in my head: two were with separate potential adoptive parents and the third was me parenting. I was describing each one to a friend, and I remember so clearly her saying to me, “Brooke, it sounds like you made your decision.” And I realized it was true. The last couple I had met with would be my Perri’s parents. My first feeling was such an inner peace that I hadn’t experienced at all throughout my entire pregnancy. Then I felt sad. I knew my time left with my little girl was not long at all. I spent the next several weeks getting to know the couple I had chosen to be my daughter’s parents, and we planned what our open adoption would look like. Just seven short weeks after our first meeting, Perri was born. I was instantly overwhelmed by the love that flooded out for this little girl. I was in a state of euphoria and held her close on my chest, staring at her immaculate beauty. She wailed when she first came out, but then was calm, quiet, and so perfect. I didn’t want to take my eyes off of her. Her parents held her next. Seeing them all together as a family for the first time, watching her, adoring her, didn’t make me sad, but proud. I was so proud of this amazing child I brought into the world. The time in the hospital was short, but for two days I was that little girl’s mother; two days that I will treasure for the rest of my lifetime. A year and a half later, we still have a lot of communication in our adoption. We visit often, and I receive pictures when I ask. My daughter is healthy, loved, well-taken care of, and so happy. I know I couldn’t have provided for her in the same way her parents do, so every time I am with my daughter I am reassured that I made the right decision. That doesn’t mean I don’t struggle with my decision. Each stage of life Perri enters brings and will continue to bring a new wave of emotions for me deal with. I would be lying if I said open adoption was rosy and beautiful all the time. Often adoption is ugly and messy, even the healthy, “ideal” adoption situations. There are still those times when I replay every moment in my head that I had a chance to change my mind and have my little girl back. Sometimes I am angry and resentful at each person who played a hand in carrying out my daughter’s adoption. I get sad when I hear Perri say “mama” and it’s not to address me or when she is hurt and it isn’t me she wants to console her. I realize, though, that each one of those passionate emotions stems from the same emotion that led me to this decision in the first place—the great love I have for my child. There’s not an hour that goes by that I am not thinking of her. Sometimes they are sad thoughts, like wishing she was with me in this very moment, that I could be her mommy, missing her so much that my heart actually feels broken. But more often there are thoughts of contentment and happiness. I always wonder what silly thing she is doing in this very minute or what new quirk will she have when I see her next. I love seeing how much she has grown in the past month; I love watching her thrive with her family and that she is happy and learning new things; I love that she gives me kisses when she sees me now. Whether I am with her or away from her, she is always the center of my world and the light of my life. 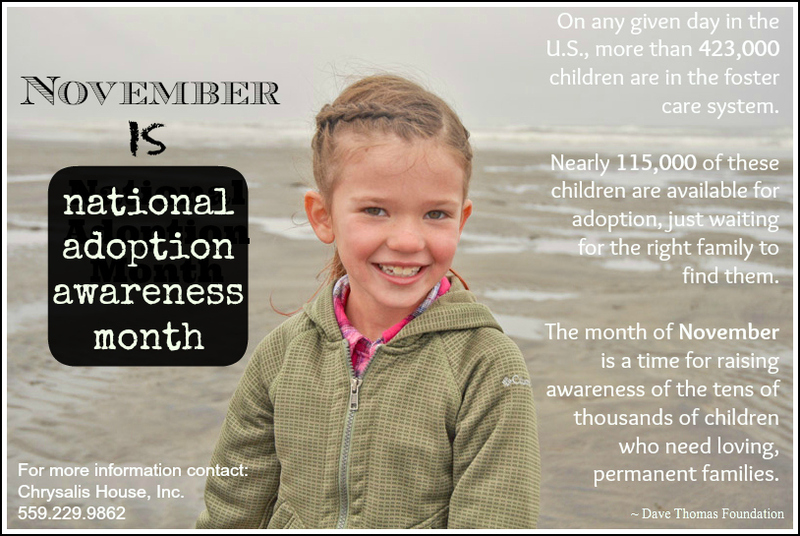 An important aspect of adoption awareness is awareness of birthmothers’ experiences. My experience as a birthmother is one that is real and valid. I am simply a mother who chose to give her child more, who aches for her child when they are apart, and who loves her daughter more than words can describe. The love a birthmother has for her child is the greatest, most sacrificial love there is. To be a part of that makes me proud to be a birthmother. Please note: If you or a loved one would like to talk with our staff about an unexpected pregnancy – please call our office at 559.229.9862. Although we are indeed an adoption agency ~ we can help you consider all your options, suggest resources and answer questions. We will support you in creating the life for your child that -you- feel is best.